The Festival of Quilts at the National Exhibition Centre in Birmingham is a key event for quilters in the UK. I usually spend three days at the Festival and make sure to purchase tickets for lectures at the show – it is a unique privilege to hear textile artists speak about their own work. This year Luke Haynes was on the lecture list and a stand at the show was devoted to examples of his work: large scale pieces (90 inches square) currently including portraits against a background of fabric stitched together using the traditional patchwork technique of log cabin. It was interesting to hear Luke speak about his journey from an Art background into quilting (Art foundation course, Architecture training). Luke learned patchwork techniques as he went along in order to achieve in fabric he result he was searching for artistically. Quilting is a largely gender-specific occupation: the vast majority of the enthusiasts, and visitors to the shows, are female. Most of these would describe themselves as quilters, and consider this to be their main hobby. Also represented at the show were a number of artists who would claim to be making art using fabric and thread rather than, say, paint. Luke’s work is bold, eye-catching and vigorous. It is very engaging and I enjoy looking at it. 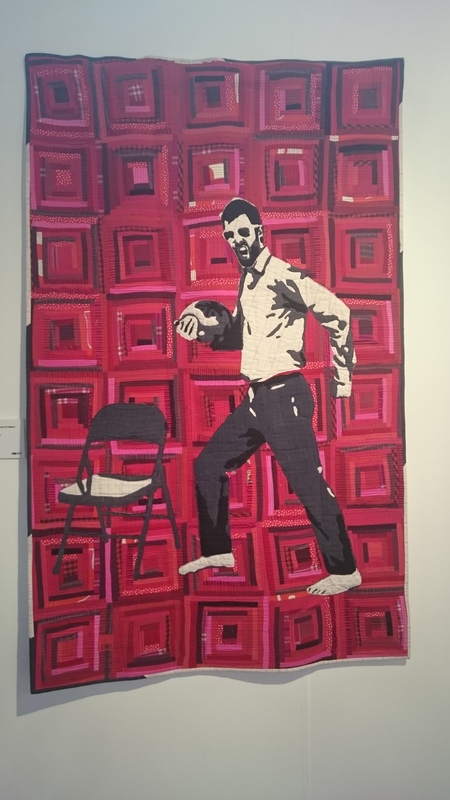 He seems to be doing better than many textile artists in getting his work treated seriously as ‘art’. I wonder how much his rarity as a ‘man stitching’ is a factor in this. What do you think?